This guide relates to the newest WADMerger version 1.95 Alpha 12. You will also need to download the previous version 1.95 Beta and the required VB Runtimes. First unzip the VB Runtime files to a temporary directory, and run their install programs. Now create a directory named WADMerger on your C: drive, and extract both of the zipped WADMerger archives into it. Change your screen resolution to 1024 x 768 pixels, now run WADMerger by opening this folder, and double clicking on the WM195A12 icon. When you start WADMerger for the first time, the settings window will appear. (See below.) This only shows the first time you run WADMerger, but you can get it by selecting Options (The spanner icon) in the main window. This window only shows up with the original version? There are some modified packages flying around which don't show that dialog on the first run. The one from the official WADMerger site does work correctly. Folders You must first use the browse buttons to set the locations of your WAD folders. 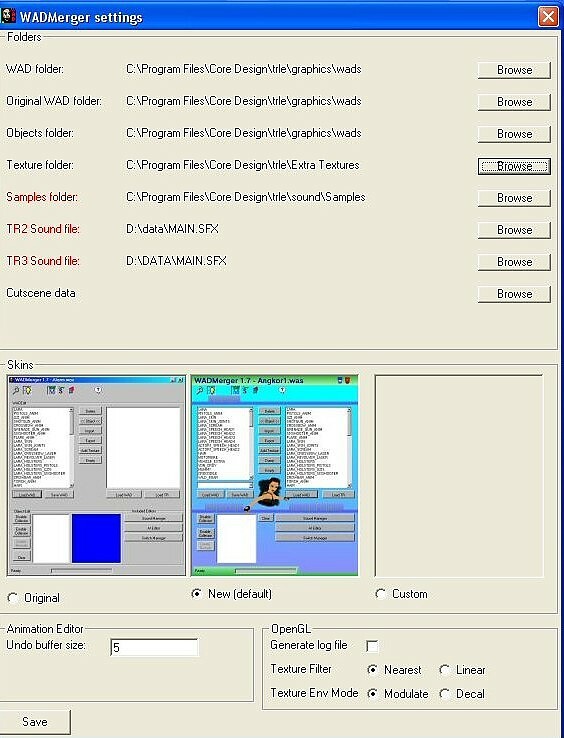 Wad folder Set to C:\Program Files\Core Design\trle\graphics\wads. Original Wad folder If you have a separated folder with original Wads, select it; or else set to the normal WAD folder. Objects folder WADMerger can also export objects. Here you can set the default location to save them in. Texture folder Set to C:\Program Files\Core Design\trle\graphics\Extra Textures. Samples folder when you save objects from other TR games, the sound samples must be saved too. This must point to TRLE\sound\samples folder (where TRLE is the place where you installed the level editor). The TR2 and TR3 sound file must point to the games main.sfx file.. When you click 'browse' a dialog will show that needs to load the main.sfx. It will be opened when saving TR2/3 levels. This file can be found in the data folder of the TR2/3 CD. Example: If you have the CD-ROM drive as D and you run TR2/3 from CD insert the CD and choose the browse button after the filename. Go to the CD and open data\main.sfx. When you load a level, make sure the cd is in the drive so it can be loaded. After loading the level you can remove the CD safely. You can open cutscenes with it but can't view frames other then the first one and neither can you copy the frames. The settings window should look like this after setting the folder locations. Leave the other settings at their default values and press the save button. When creating a shortcut to WADMerger,remember to link to the WM195A12 file. This tutorial is intended to get beginners started creating a custom wad using WADMerger. The section you will be using is the Wad editing area outlined in red in the picture below.The function of all Buttons for this section is described next. 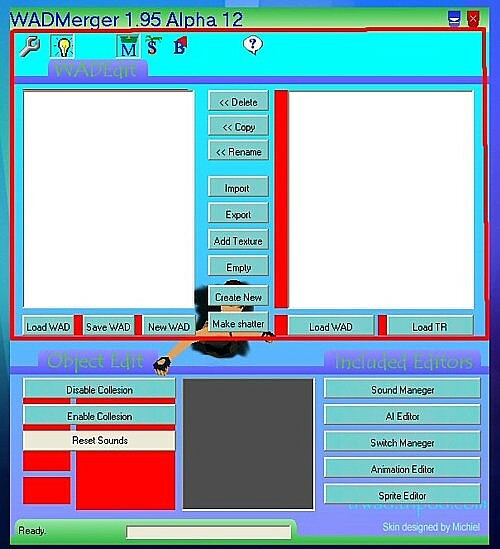 displays options screen. You can set-up the folders from TRLE and change skins in this. It it's pressed Smartcopy is used. If not, Smartcopy is ignored. Displays the movables in the list. Displays static meshes in the list. Displays sprites in the list. Displays the about dialog. It contains the names of the people working on WADMerger (including the skins and documentation). Click this Button under the left window to load an existing WAD, which you want to work on. Click the Load Button under the right window to load a WAD, from which you want to copy objects. Use this Button to save your edited WAD. Click on this Button, if you want to build a completely new WAD. This Button will load a TR level, (TR1-5). From which you can copy objects NOTE this function does not always work with Tr 4 Levels. Deletes the selected moveable in the WAD you are editing. Copies the moveable, mesh or sprite you selected on the right to the left list. If you already have the object in your WAD you will be asked whether you want to overwrite it. Will show a dialog to load a moveable and add it. Will show a dialog to save the selected moveable to a file. Will show a dialog to load an image file and add it to the texture data. You will use it with StrPix, when texturing objects you have created. Will make this moveable or static empty. It will be invisible in the game. You must use this on SKIN_JOINTS when using TR1-3 outfits else TR will crash. Creates a total new object. You will be asked for the name. After creating it, the object will be empty. In the animation editor you can add meshes to it (meshes can be created using StrPix). "Make Shatter�:This button opens the shatter wizard which allows you to make shootable walls and windows upto 8 clicks high. Note you must have the texture you want to use saved as a bmp or jpg format file, and it must be no larger than 128 x 128 pixels in size. Building a shatter object is very easy, load your wad then start the wizard and click on the Load button & browse to your saved texture file then click the open button.Your texture will appear in the small window, now select how high you want it & click build. The new shatter object will be added to your wad, click on the �S� button on the top toolbar to see it listed. Go ahead and click the load wad button under the left hand window a new window will open displaying a list of your wads. Click on the tut1.was listing. Next click load wad button under the right hand window but this time select the Catacomb. Was file, Now click on the small square with a + sign next to the level name, to display a list of objects in the wad and use the scroll bar on the left to scroll down through the objects. Click on the WRAITH3 to highlight it. You will see it previewed in the small window at the bottom of the WADMerger interface. If you hold the left mouse button down in this window, the object will rotate. Now press the <<Copy button, the WRAITH3 has now been added to the tut1 wad. Just for fun click on the Mummy in the left hand list, you�ll see the preview feature works for both lists. Smartcopy helps you when you copy objects that can use more then 1 slot (like DOOR_TYPE1, DOOR_TYPE2). With Smartcopy enabled (the default setting) doors; switches, Animatings, trapdoors, pushables and quest items are not copied to the edit wad with the same ObjectID. Smartcopy looks in the edit wad if there are any DOOR_TYPEx slots free. It will copy the object to the first free slot. If no slots are free, a message will warn you. To see how this works in practice, click on Door_Type 2 in the right hand list. At the moment there is no Door Type_2 in the tut1 wad, click the <<Copy button. The door has appeared as Door_Type3 in the tut1 wad, since this was the first free slot. Repeat this again and the door will be entered into the Door_Type 5 slot, because the Door_Type 4 slot is already in use. Now we�ll return your wad to its original state. Highlight the WRAITH 3 object in the left list and click the <<Delete button, repeat this for the Door_Type 3 & Door_Type 5 objects. So far we have only worked with movables, now lets turn our attention to static objects. Leave the tut1 wad loaded in the left window and click the static�s button on the top toolbar, a list of the static objects in the wad is displayed. Load the coastal wad into the right window; scroll down until you can see the rock, architecture & debris items. Make sure Smartcopy is enabled. Copy these items from the coastal wad, architecture 0, architecture 2, rock 6, and debris 0. When you look at the tut1 wad, you�ll see the items have been added into empty plant slots. This has occurred even through the debris 0 and architecture 2 slots were originally empty in the tut1 wad. Lets see what happens with Smartcopy switched off, click the Smartcopy button then reload the tut1 wad into the left window. Once again copy these items from the coastal wad, architecture 0, architecture 2, rock 6, and debris 0. 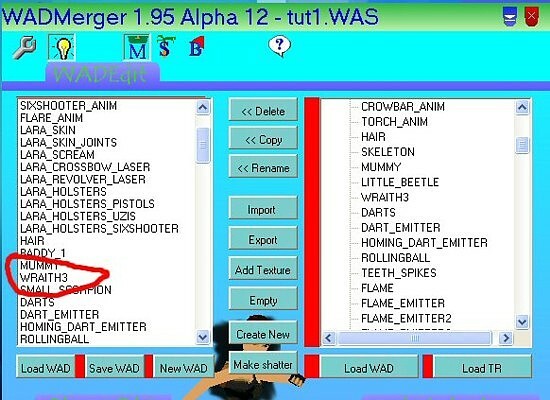 This time when you look at the tut1 wad, you�ll see the objects have been copied into the correct slots. But there are now two architecture 0 items listed, this is because the slot was already in use. The second one is the item you copied; the first was originally in the tut1 wad and will not be saved when you save your wad. If you want to add objects from a Tomb Raider CD, insert the CD and click the Load TR button. In the new window, which opens browse to the data folder of the CD & select the level you want, it will then be loaded into the right hand window. For further information see the Documentation found in the WADMerger Documentation folder in the directory where you installed WADMerger.